As your metal casting supplier, let buyCASTINGS take the guess work out of your next project! 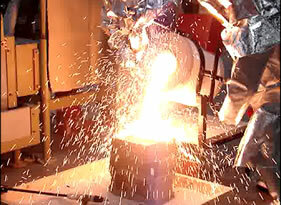 buyCASTINGS.com, Inc. is an integrated supplier of prototype and production metal castings. We work with buyers, designers, and engineers offering the most advanced and innovative technologies in producing metal fabricated parts and cast components. We have a highly qualified network of foundry experts and professional resources. buyCASTINGS is a trusted partner in the casting industry. We exercise this trust and use our knowledge to match your casting requirements. Our engineers are experienced in all segments of the casting industry. They have the knowledge and the expertise with various alloys from aluminum, brass, copper, cast iron, gray & ductile iron, stainless steel, titanium, zinc and other specialty metals. We provide the most advanced process techniques using sand, investment, permanent mold, die casting, among others to meet or exceed your requirements. Our engineers are capable of managing your projects from start to finish. The will assist you and your team in all aspects from tooling, manufacturing, pre & post finishing work all aimed at delivering exceptional quality parts and service. buyCASTINGS will bring you choice, convenience, and competitive cost. Our proprietary software has a global manufacturing network of over 700 qualified foundries that span the United States, Canada, Mexico, China and India. We know who can deploy the latest technology and innovation to help you save time and money. Our goal is solving our clients' challenging needs - something we have been doing from day one - matching needs with solutions. buyCASTINGS also has three other divisions; FOPAT Productions, making FOam PATterns for investment castings. FOPAT is an innovative patented material designed to make accurate patterns. Solar Power & Light LLC, SP&L will put the"power in your hands" to lower operating expenses, protect the environment, and achieve energy independence. CALS LTD improves products through composite material and design innovation utilizing a patented proprietary advanced foam technology. Visit our websites to learn more.